If you want to protect your Excel files from the eyes of others, you can actually password protect it in Workbook level. 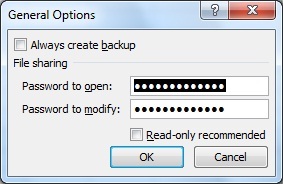 With this password protection, when you open the Excel file, Excel will ask you first for a password before you can view the contents of the workbook. 1) Go to Save As then click the General Options from the Tools options. 2) At the General Options, enter the password key at the Password to open and modify. Make sure to remember your password else you need an Excel password unlocker. This Excel trick will be applicable to Excel 2007 and higher versions. You know, I did a secretarial job w in school when I was still in Pinas but I never liked using excel lol. ops sorry! I really didn't see this article earlier. I saw the other one. Anyway, I used to do this when i was still working as a data encoder way way back. I had to put password in every file i saved because there were other workers who uses my computer. It's better to be safe than sorry right? Yes this is very important especially for files with confidential information like your budget or even salary information. this is great ideas however never done this I've only see this one of my friend study Computer encoder and computer programming a good tip for securing your files.